I'd say that I'm a decent artist. I am no Da Vinci, but I ocaisonally make sprites and pixel art. Everything on this page was made by me so enjoy! This was an abandoned project of mine from around 2015 where you could put a virtual train on your website. You could interchange train cars and locomotives and use the marquee tags to get it moving. This is all I've made. Maybe I might make more of these in the future. EDIT: I made another locomotive after 2 years and this time it's animated. 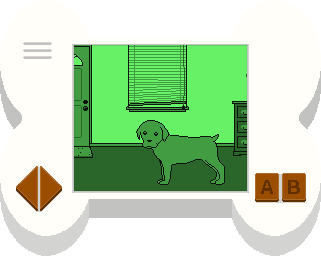 I was trying to develope a game called Duke the Dog which would have been a virtual pet type of game. I made some sprites for the game but unfortunately for me, I can barely code. Maybe some day this will be a game.